It was shocking to hear today of the death of Dolores O’Riordan, the memorable vocalist for the Irish band The Cranberries. She was only 46. The last time I had spoken to her, in a 1999 interview amid a summer Cranberries tour, she had talked about how difficult it was in the band — at least util her son was born in 1997. “I hated singing, I hated being on stage, I hated being in the Cranberries,” O’Riordan said. “I was constantly crying. I was going insane. The band nearly broke up following its 1996 tour that ended with a string of cancellations because of exhaustion. And O’Riordan, the force behind such Cranberries hits as “Linger” and “Zombie,” had had enough of the dizzying cycles of recording, promotion and touring. She thought she might not ever sing again. It gave her a reality so different from the facade of the rock life. She was just 18 when the Cranberries had their first hit with “Linger,” but perhaps no one, regardless of age, is truly prepared for this strange world. “Living in hotels, in a different city each day, with no sense of reality,” she said. “Not being allowed out without security, and then when they allow you out, there’s all these screaming people who think they love you, but they don’t even know you. And if they lived with you for two days, they wouldn’t even like you. “So you’re stuck in your room watching CNN all day. People start to feel like something has gone wrong for you. Or treat you like an alien. You’re living in a fishbowl, usually with all these guys — there’s no girls out there. And you miss your family, and you miss weird things. But when she did get home, “people think you’re from another planet,” she said. “I see why a lot of celebrities go nutty and sometimes do the old final number to self. It’s so surreal. Through her emotional experience, “I learned a lot,” O’Riordan said. 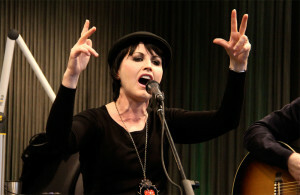 O’Riordan was in London for a recording session when she died. No details on the cause were immediately available. The band cancelled a string of shows in 2017 after O’Riordan was told by doctors to stop working because of a back problem. Shows that had been planned for North America last fall were canceled before they began, though the band performed a Billboard staff party in New York during the holidays.